The best hostel I ever been. The atmosphere was amazing that I felt at home. Very clean and kind people. I will recommend it for friends. Thanks for everything. The best hostel I’ve ever stayed in. Such a homey vibe and the staff treat you like a friend since the beginning of your stay. And it is in the city center, close to everything. I really recommend this hostel. 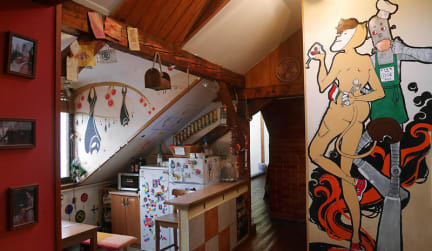 O melhor hostel que já fiquei na minha vida! Ambiente aconchegante e que permite a verdadeira convivência entre os hóspedes. Os funcionários são sempre muito atenciosos, a limpeza está sempre em dia, não tenho nada para reclamar! Recomendo e pretendo voltar! Perfect location and staff! 2 things that I didn't like: bed unconfortable and Wi-Fi wasn't working in The bedroom.